The Aina Mahal (lit. Palace of Mirrors) is an 18th-century palace located next to the Prag Mahal in Darbargadh, Bhuj, Gujarat, India. The palace was built by Rao Lakhpatji of Cutch State around 1750. His master craftsman Ram Singh Malam designed the palace in local style and decorated it in the European style with glasses, mirrors and tiles. The palace had two floors. The first floor has the Audience Hall, the Pleasure Hall, the Hall of Mirrors and the State Apartments. The second floor has the ante-chamber, Darbar (Court) Hall and Marriage Hall. It is now converted into a museum storing "europeanerie" collection including clocks, wares, mechanical toys, paintings and pictures. The Aina Mahal was built by Rao Lakhpatji (r. 1741–1760) around 1750. [A] The chief architect and designer of the palace was Ram Singh Malam, who lived in Europe for 18 years and mastered several European craft and architecture skills. The construction costed 80 lakh (8 million) koris or about Rs 20 lakh (2 million); the state revenue of three years in that period. An Englishwoman Mrs. Postnas visited the palace in 1830 and noted her impressions in her memoir Cutch[B] (1839). She remarked on the "motley and incongruous mélange of ornament" in a room illuminated with large candles in a noon where she found half a dozen musical clocks playing at once among jelly glasses and old vases. The palace was converted into a museum in 1977. It was damaged in the 2001 Gujarat earthquake and later, a part of the palace was restored and now houses the Aina Mahal Trust Museum. The Aina Mahal is located near Prag Mahal. The palace is a two-storey mansion constructed with stones and decorated with stone carvings and wood fretwork. The exterior is whitewashed. It is designed in an Indian local style but decorated in the European style. The palace floors are laid with blue delftware tiles while the marble walls of the palace are decorated with mirrors which are separated by gilded frames. These walls are further decorated with fitted shelves on which glass and ceramics were displayed. The rooms were illuminated by hanging candelabra and chandeliers with shade of Venetian glass. The pillars and roofs are decorated with golden mouldings and other ornamentation. The space between pillars and walls are filled with triangular mirror compartments. The first floor has the Audience Hall, the Pleasure Hall, the Hall of Mirrors and the State Apartments. The second floor has the ante-chamber, Darbar (Court) Hall and Marriage Hall. Near the entrance of the first gallery, there is a 15-metre (49 ft) long and 22-centimetre (8.7 in) wide scroll painting depicting the royal procession. In the painting, the procession is led by a mounted Arab cavalier followed by a flag bearer, Arab infantry, a pair of bullocks drawing a cannon, lancers, a chariot with a family deity, camel riders. Following further, in the centre of the painting, Maharao Pragmalji II on the howdah of a decorated elephant is depicted. He is followed by soldiers and flag bearers. The scroll is dated 1876 and is signed by its painter Vadha Juma Ibrahim. The collection is an early example of "europeanerie", an 18th-century obsession of European things among the Indian nobles. The collection includes English, French and Dutch chiming clocks; glass wares; ceramics; china wares; mechanical toys; celestial globes; arms; palanquin; costumes; furniture and the things associated with court life. There is an operational pendulum clock synchronized with Hindu calendar in collection which made in Bhuj by Morarji Lakhamshi Soni in 1839. The museum has a large picture collection including some acquired by Ram Singh Malam during his visits of Europe. The subjects of the paintings in the State Apartments include British, Flemish and Italians including the portraits of Rana Ranjitsingh of Mewar, Raja Bakhtsingh of Marwar, Empress Catherine the Great. It also includes 18th-century prints of A Rake's Progress by William Hogarth and related moralizing series. There are paintings depicting the courts and portraits of the royals of Kutch including some with Mughal influences. Occasionally real gems are introduced on the surface of painting where ornaments such as ear-rings and necklaces are depicted. Hira Mahal or the royal bedchamber is located in the centre of the first floor of Aina Mahal next to Hall of Mirrors and its reception. It measures 4.6 by 7.3 metres (15 ft × 24 ft) and has a bed of Maharao Lakhpatji. The legends say that Maharao used to use a bed for a year and then auctioned it off after ordering the new one. His beds were purchased with state funds. The auction supplied him with funds for his other entertainments for a year. His last bed with pure golden legs is kept along with his buckler and sword studded with diamonds presented by the Mughal Empreror Alamgir II in the 18th century. The bed is surrounded by more than twenty seven large mirrors inlaid with gold flowers and semiprecious stones and framed in Rococo or Baroque style guilt frames. The floor and walls surrounding the exterior of the Hira Mahal are covered in cloth panels of Kutchi silk aari embroidery fabrics while its ceilings, pillars and doors are covered in mirror-work and guilt wood-carvings. The Fuvara Mahal or the Pleasure Hall is located adjacent to the Hira Mahal. Except the narrow corridor along the walls, the whole chamber is a pleasure pool with a raised square platform in the middle which can be approached by a narrow raised aisles on three sides. The pool was filled with water by cleverly designed siphons and pumps. There are fountains in the pool which can cast spray in patterns and cool the air in the hot summers of Kutch. The corridor is lined by pillars which are surround the pool. They support the ventilated roof. The capitals of these pillars are decorated with Chinese styled carvings. The throne in the centre of the platform was surrounded by water sprays and fanned from above. It is a place where Maharao held his courts and enjoyed his pleasures. The chamber was illuminated by hanging candelabra. There are some glass paintings with Chinese influences brought in Kutch in 18th century by merchants in the gallery surround the Fuvara Mahal. The exterior staircase takes to the second floor, where the courts were held. In the ante-chamber, there are Mughal farmans (royal decrees) issued between 1617 and 1658 by Shah Jahan, Jahangir and Dara Shikoh are displayed which were mostly addressed to Rao Tamachi (r. 1655–1666). A farman dated 20 April 1617 issued by Jahangir praises the rulers of Kutch for their help in the conquest of Gujarat. Another farman dated 8 April 1657 issued by Shah Jahan and addressed to Gujarat Sultan Muzaffar Shah III and Rao Tamachi warning a surrender of Akhiraj who had taken asylum with them after plundering a Dutch ship. Another farman dated 6 March 1657 asks Rao to pay due respect to the governor of Surat, Ali Kunwar Beg. A farman dated 6 December 1657 issued by Dara Shikoh asks Rao to visit his capital Agra and preparation for his visit to Bhuj. In another farman dated 28 January 1658, Dara Shikoh asks Rao to capture a rebel named Qutubuddin who had attacked Kutch during his visit and offers his help. The Darbar (Court) Hall has a silver throne with 19th century guilt wooden chairs on its both sides. There is also marriage hall built for Maharao Khengarji III (r. 1876–1942) in 1884. Various weapons are exhibited on the walls while a perfume sprayer is placed in the centre of the hall. A door of the palace is decorated with inlaid ivory and gold made at the cost of 400 koris by a carpenter named Madho in 1708 during the reign of Pragmalji I. The collection also include Mahi Maratib, a golden fish, which formed part of coat of arms of Cutch State which was gifted to Maharao Lakhpatji by Mughal Emperor during his visit of Delhi. There are artistic horoscopes of rulers drawn in the local Kamangari painting style by astrologers of each ruler. It includes a 38.7-metre (127 ft) long horoscope of Rao Pragmalji II dated 1839 which is believed to be the longest horoscope in the world. ^ Sources give different dates ranging from 1750 to 1761. The dates corresponds to the reign of Lakhpatji. ^ a b c d e "XVII". 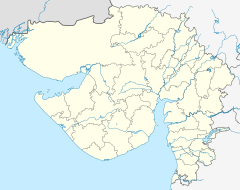 Gujarat State Gazetteers: Kutch district. Directorate of Government Print., Stationery and Publications, Gujarat State. 1971. p. 589. ^ a b c d e f "The arts, in past tense". The Hindu. 22 April 2001. Retrieved 26 March 2019. ^ a b c d e f g h i j k l m n o p Jethi, Pramod; London, Christopher W. (2000). "A Glorious Heritage: Maharao Lakhpatji and the Aina Mahal". In London, Christopher W. (ed.). The Arts of Kutch. Mumbai: Marg Publications and National Centre for the Performing Arts. pp. 48–61. ISBN 8185026483. OCLC 44835875 – via EBSCOHost. ^ Rushbrook Williams 1958, pp. 140–142. ^ a b c d e Jaffer, Amin (2000). "The Aina Mahal: An Early Example of "Europeanerie"". In London, Christopher W. (ed.). The Arts of Kutch. Mumbai: Marg Publications and National Centre for the Performing Arts. pp. 62–75. ISBN 8185026483. OCLC 44835875 – via EBSCOHost. ^ a b Mrs. Postans (1839). Cutch; Or Random Sketches, Taken During a Residence in One of the Northern Provinces of Western India; Interspersed with Legends. London: Smith, Elder and Co. Cornhill. pp. 39–40. ^ a b Watson, Paul (11 February 2001). "Treasures of India's Royal Past Among Quake Losses". Los Angeles Times. ISSN 0458-3035. Retrieved 26 March 2019. ^ a b c d e f "Aina Mahal". Gujarat Tourism. Retrieved 26 March 2019. ^ "Lack of funds takes a toll on 2001 tremor-hit Aina Mahal". Express India. 15 February 2008. Archived from the original on 16 February 2008. Retrieved 26 March 2019. ^ Biswas, Soutik (26 February 2001). "The Remains of Days Past". Outlook India. Retrieved 26 March 2019. ^ a b c d Rushbrook Williams 1958, pp. 141–142. ^ Sastri, K. A. Nilakanta (1959). "Ram Singh Malam of Mandvi". Journal of the Assam Research Society. Kamarupa Anusandhan Samiti (The Assam Research Society). XIII: 19–21. ^ Rushbrook Williams 1958, pp. 140–141. ^ Azhar Tyabji (2006). Bhuj: Art, Architecture, History. Mapin. p. 34. ISBN 978-1-890206-80-2. Wikimedia Commons has media related to Aina Mahal. Rushbrook Williams, Laurence Frederic (1958). The Black Hills: Kutch in History and Legend: a Study in Indian Local Loyalties. London: Weidenfeld and Nicolson. pp. 140–142. OCLC 314891065. This page was last edited on 18 April 2019, at 20:38 (UTC).